If you've made it to a ski resort before, you've probably seen the kids who show no fear while they charge down the mountain. 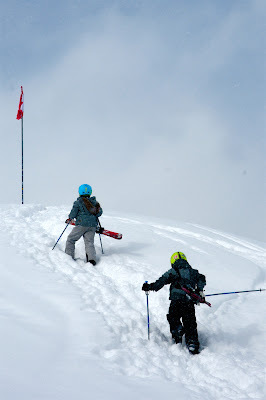 Have you seen eight and nine year olds hiking to the top of a sidecountry peak before? Neither had I, until today at Park City Mountain Resort. It brought a tear to my eye. What inspired them to hike into the unknown? Their big brother told them it was cool. Ed speaks my language. Except with more profound words. Thanks for sharing the wisdom Josh. "It's all because of doing things by halves, saying things by halves, being good by halves, that the world is in the mess it's in today. Do things properly by God! One good knock for each nail and you'll win through! God hates a half-devil ten times more than an archdevil."